:: Our Mini Mala Collection:: Let's blooming.This lovely breakaway cat collar is handmade with 100% cotton fabric and accentuated with a removable knitted flower,So many design. The flower attaches to the collar with an elastic loop for comfort.Please choose the design what you want from upper pictures. **https://live.staticflickr.com/65535/33798685208_a243bd8281_c.jpg** **https://farm5.staticflickr.com/4603/39579594502_a9d77b5255_c.jpg** **https://farm5.staticflickr.com/4653/38900617084_1457c9d70c_c.jpg** **https://farm5.staticflickr.com/4672/38900616584_44642998af_c.jpg** 1.Design for cat. 2.Super safe with Breakaway bucket. 3.Handcrafted:3 4.Hand sewing detail for extra security & Strength 5.Personalized collar 6.Fully adjustable - 2 size collar for Kitten (14-20 cm. )or Adult cat (18-29 cm). **Remark** 1.If you need a bell (It's for free.If your cat's OK with it.) 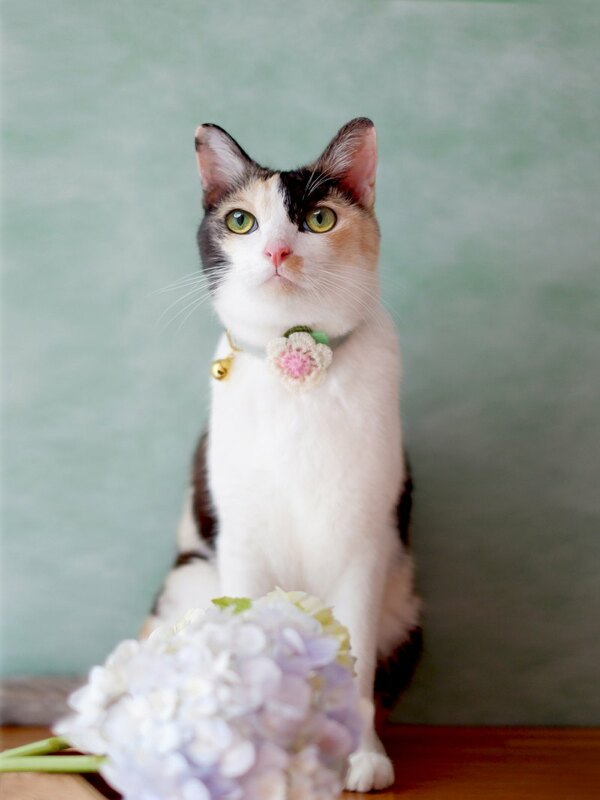 Please **"NOTE"** 2.If you need a leather tag name for cat collar.You would like to order our cat tag for additional item(Please check on our store). 3. You can request a dog buckle for dog. Thank you so much and have a good day.